We flew into Reykjavik, Iceland, on Saturday morning after an overnight flight, which is always fun, by which we mean that other thing. But despite some sundry setbacks, we made it to the bus and got to our hotel. They were kind enough to let us into the room early and we dropped stuff off and then went hunting for brunch. It was a holiday weekend so a lot of places were closed or had irregular hours, but we found a nice little café nearby and enjoyed a good meal. I particularly loved the bathroom décor, which included a barred window piled high with…stuffed rats. Hey, port city humor, gotta love it. After that, we wandered around and around and down to Culture House, which is a museum/contemporary art gallery. And by then, I had walked my feet into the first exciting set of enormous blisters for the trip. I had bought new walking shoes for the expedition and a second pair of broken in shoes that felt okay on my arthritic toes, but that, alas, was not enough. So limping through Scandinavia on bleeding and generally swollen feet was a thing that happened. At any rate, we went back to the Hotel Holt, which is a fabulous old pile in the artsy section of Reykjavik, filled to the brim with the former owner’s art collection and antiques. These were gloriously eclectic so there was a lot to look at. We also enjoyed our meals (one dinner, three breakfasts) there and our room was reasonably comfortable so wins all around. Sunday was intended to be our queer history walking tour day, but the tour company cancelled on us due to sheer volume of tourists, so instead we wandered around some more, went to Volcano House and other fun places, then met up with Minnesota artist Sishir Bommakanti for dinner. Sishir’s father is a former coworker and current friend of mine, hence the connection, and Sishir was in Reykjavik on an art fellowship. He’s got shows up at MCAD and Greylab now of his horror-influenced art – I recommend checking it out! He’s very good (also, a fine and pleasant dinner companion). After dinner, we went our respective ways, in our case, to take a long stroll up the sculpture walk on the waterfront to the Harpa (big landmark concert hall) for “The Icelandic Sagas: The Greatest Hits,” which was mostly hilarious. Then it was back to the hotel to catch some zzzs before getting up to go to the Blue Lagoon on Monday. Blue Lagoon was blue, rocky and very crowded. I found the experience overrated, kind of like bathing in lukewarm pea soup. But we can say we went. After that, we headed back to the hotel, cleaned up and wandered down to the Reykjavik Pride headquarters, at the sign of the rainbow unicorn. We bought a few small odds and ends, then went in quest of dinner. An enterprising young man who had just opened his new restaurant that very day beckoned us in with samples and we had a nice dinner and chat with him. Overall, Reykjavik was charming and kind of reminiscent of Wellington, NZ. I would not go back again during high tourist season though - the country is really not built for the amount of traffic it's seeing and it shows. Though I might make an exception for Pride, which looks amazing. The next day was the ever-popular "Rise at the crack of dawn to trundle down to the bus station and catch a bus to the airport." Reykjavik Airport is not for the faint of heart and there were sundry issues before we could check in. After some unpleasantness, we managed to get on the plane and head off to Helsinki. About 5 hours later, voila! New country, next round of time zone adjustments. And off to another hotel, this time by taxi because I wimped out. I was quite right, as it turned out, since negotiating the trains and trans with luggage was a challenge. At any rate, the hotel was pleasant, though further from the main train station than we hoped (only an issue because of my feet, which got rapidly worse over time). After unpacking, we strolled out to the esplanade, hit the farmer's market for dinner, ran into folks, then collapsed back the hotel (after I stuck the swollen hamhocks on the ends of my legs under the shower for a bit). The esplanade and Helsinki harbor were gorgeous, which was good because we were back there the next morning to catch a ferry to Suomenlinna Fortress with A.J. Fitzwater and other fine folks from the Con. The Suomenlinna tour was quite lovely and interesting and I heartily recommend it if you find yourself in Helsinki, especially on a nice day. From there, we went on to lunch, followed by a tram adventure! Apparently, "This tram has been rerouted. Please get off here and wait for the next one." translates splendidly, even into languages you don't understand. So we got off, after I double-checked with the driver, and immediately ran into the charming Caroline Stevermer and one of her friends. Hilarity ensued. See Part 1 for the con write up. After that, there was more con. Then on Sunday night, we set sail for Stockholm on a cruise ship. We shared a berth with A.J. and I ran into author Kyell Gold and one of his friends on the ship so we all ate together and hung out. The scenery was gorgeous, the boat enormous and mazelike and the meals a tad overpriced. But at breakfast in the morning, the coffee choices were a. Moomin coffee or b. Tom of Finland coffee because Finland is awesome. Also, the islands in the Baltic between Finland and Sweden are beautiful. I'm very glad we sailed even though I was pretty groggy when we got there. Stockholm is a very pretty, very expensive city. We took a cab to our hotel, then wandered over (more walking! Yay!) to a design/tea shop in a ritzy part of town for tea and lunch. The tea was to congratulate A.J. on their recent Vogel Award win - a tradition we started in New Zealand last year. :-) Swedish high tea is heavier on the nonsweet stuff but is quite tasty. After that, we wandered back along the Drottninggatan, which is a pedestrian mall and major shopping thoroughfare. 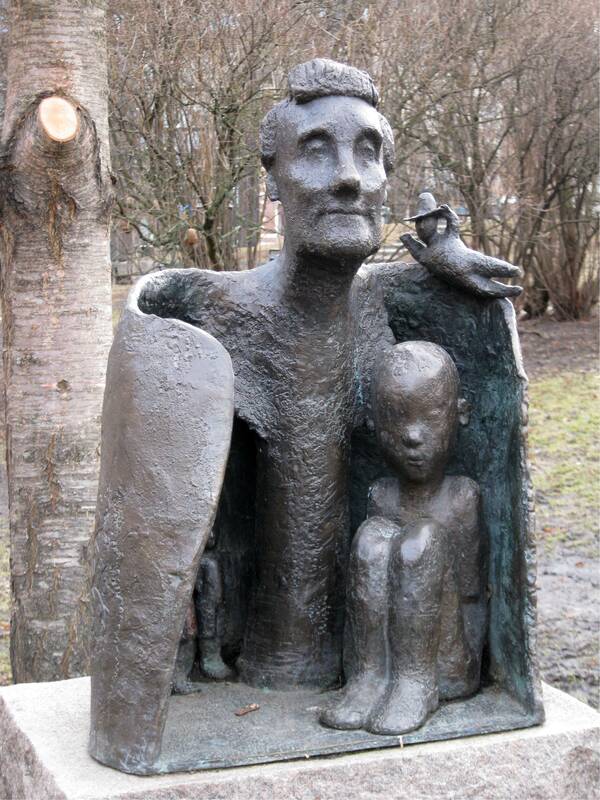 We found an Astrid Lindgren statue in the park across from the hotel (much smaller statue than the Strindberg one). And the park itself was lovely. Dinner was good, sleep was good and then we got up the next day and walked for blood ever looking for our damn tour bus. I hated my feet and life and anyone who suggested walking further but we did finally find the right stop and the city was pretty fabulous from its upper deck. We went to the ABBA Museum and soaked in all things ABBA for a few hours. Then we took the water taxi to Old Town, which was epic and lovely and historic. We checked out the charming gay coffeehouse, the science fiction and fantasy bookstore, innumerable shops and parts of the Royal Palace, including the armory where we saw Queen Christina’s coronation coach, before meeting a local author and artist for dinner. Then we headed back, leaving A.J. to chat with her friend, did some frantic packing and foot showering and went to bed. The next day was a last wander of the neighborhood before heading out to the airport, flying to Reykjavik, scrambling between planes and heading home. Overall, nice people, interesting countries, cool history, lovely scenery, utterly exhausting and fairly painful, through not fault of the countries visited. I’m still a bit loopy and worn down so while I admire my ambition in planning this trip, I think I stretched us too thin. I hope to go back some time and visit each at a more leisurely pace. I’m splitting this into two parts because it would otherwise be huge. It may still be huge, but shorter huge this way. We arrived at the con after a couple of days in Reykjavik, Iceland, and a tour of Suomenlinna Fortress. By then, my feet were covered in blisters and were quite sore (despite the new walking shoes I acquired for this trip), which was NOT FUN. It also turned out that our hotel was about a 15 minute walk/limp from the trains or trams to the Expo Center, where the convention was taking place, then a 20 minute ride + a short walk after that. Given that, having a scheduled event every day of the con meant that I didn’t get to see as much of Helsinki or of the convention as I would have liked it. Sigh. But still, there was lots of fun to be had! Day 1 was our “Gender Pronouns: Who Needs Them?” panel. Some nice MN fans had already tracked me down to let me know that the con had more attendees than room space (this changed a bit by Day 2 when they got more rooms and swapped some things out) so I knew I needed to turn up early for panels. And there were so many people! Second-biggest Worldcon, in fact, which was pretty cool. I got through registration painlessly (Pat Cadigan hugged me! ), ran into friends in the lobby and located the official con bookstore, Rosebud Books, in the Dealer’s Room. Having confirmed that they were willing to peddle my books once I brought them in, I headed off to brave the crowds at the panel room in a bid to be sure I was on time (while the other panelists and the moderator waited for me in the Green Room. Oops.). But it worked out and the panel was pretty good, if a tad short. Due to the overcrowding issues, panels started ending 10-15 minutes early so that people could get to the next event. Understandable, but kind of disappointing if one was one something with a lively discussion. This was one of those panels; we covered a lot of ground about linguistics and genre and why speculative fiction in English wrestles with new or just plain different pronouns and people said nice things afterwards so it felt like it went well. After that, we embarked on the great dinner expedition to find the vegan Vietnamese café with Charles Stross, his wife, Feorag, Heather Rose Jones, Paul Weimer, my spouse and some lovely friends of Heather’s. Good conversation, eventually good food, pleasant company and then we had to go back to the hotel because we were exhausted. It should be noted that I ran into people I knew everywhere I went so there were meals and tea and hanging out and just sitting around and wandering the Dealer’s Room and so forth throughout the weekend. It should also be noted that I’m still a bit jet-lagged, that we went through 3 countries in 11 days and I met many people, which means I forget names, when we chatted and so forth. Please do not take this personally – it’s me, not you. For realz. Day 2 was my signing, which was short and sweet and featured nice chats with Natalia Barron, Kathryn Sullivan, Heather, Elizabeth Bear and other nice folks. I also signed 2 books! Then GRRM showed up with his entourage and life was so much dross. Sadness. Ah well. Do I remember what else I did? Not really. Went to a panel and talked to folks, lots of folks. I met up with a friend from high school who I haven't seen since we graduated and we drank tea and equivalents and got caught up. Ran into some people I knew from the Nebula Weekend in Chicago and/or online and enjoyed a tasty dinner while dissecting the writing life. Staggered to the train, limped back to the hotel, slept. Day 3 was the LGBTQ Worldwide panel, which went okay but I think could have been stronger. This was definitely one of those panels where I think an additional 15 minutes would have made a difference. But so it goes. Writer Bob Angell showed up for it and we got to go for lunch afterwards, which was lovely. From there, I zipped off to a boutique that Elise had recommended and acquired some rocking new work tunics - Boutique 52, for those curious. Dinner was somewhere tasty but not memorable. I talked to a lot of people, but didn't make it to a lot of con. Day 4 was two panels, both of which went really well - good discussion, lively audience engagement, large attendance, all the things one looks for in panels. I had lunch with Caroline Stevermer, then spent a couple of hours hanging out with Ginn Hale and Nicole Kimberling of Blindeye Books talking about life and small press publishing. Then I got to hang out with the crew from Outer Alliance that evening, and Julia Rios afterward, before heading hotelward in the pouring rain. Frenzied packing and clothes drying, then collapse ensued. Day 5: packed and ready to go, bags stored at hotel, met up with editor and author Kate Laity while Jana checked out the botanical gardens. Found out that all my books sold. Met up with author A.J. Fitzwater and boogied off to the hotel after tearful farewells. Got to the ferry terminal in good time and headed for Sweden! Next up, the nonconvention portions of the trip. Thoughts: good con overall, lots of great folks, pleasant panels, cool things to see (at least what I saw of them). Down sides: one panel location wasn't on the con maps, shortened panels due to space issues. Otherwise, the location was good and mostly accessible, from what I could tell. Lots of restaurants and public transportation nearby and Helsinki was grand. Would travel to again, 10/10. So, my Worldcon schedule is so very full of awesome. Everything looks so interesting! Squirrel Girl! Build a World! A panel on aging! A panel on building a small press (and yes, starting to get back on track with stuff. Again)! And OMG, I'm moderating a panel on cyberpunk with Pat Cadigan on it. She's justifiably considered to be one of the great cyberpunk writers, for those just tuning in, and she's one of the GoHs this year. I'm going to be doing a fair amount of prep work for this con, that much is clear. And, of course, lots of other works. See also this list of recommended fiction for Heiresses of Russ 2012, my lists from the Bi Science Fiction and Fantasy Roundtable, other resource lists from my other Chicon panels - here and here, a guest blog I wrote on lesbian protagonists in sf and f, LGBT themes in speculative fiction Wiki entry, GLBT Fantasy Reviews, LGBT Fantasy Fans and Writers and the Outer Alliance podcast and blog. Here's what I wrote down from the gender roles panel. As you can see, we visited a lot of different parts of the genre, partially because our original moderator didn't make it and partially because the original description only mentioned science fiction and we wanted to broaden things a tad. One addition: someone in the audience asked about sf/f with trans men as protagonists and we were stumped. Then I went home and looked in my bookcase and promptly found Supervillainz by Alicia Goranson, which has alternating viewpoint characters, both trans. Okay, second addition. We, the panelists, talked about our current work in relation to the topic, more or less. Reference list from Chicon7 panel "We're Here, We're Queer...Are We Used to it?" The following is what I wrote down by way of resources during the discussion on the panel "We're Here, We're Queer...Are We Used to It?" Cecilia Tan, moderator. Kevin Roche and Catherine Lundoff, panelists. As per the norm, let me know if I missed anything. Went with our friends Mark and Laurence to Vermillion, an Indian/Latin American fusion restaurant. It was every bit as amazing as we remembered and we had a terrific meal sharing everything that each of us picked. Then back to the hotel where I got in line to go see the Hugos. It went pretty quickly though there was some doubt that I would find friends to sit with and that I would be able save a seat for Sara Olson. Happily, Catherine Schaff-Stump saved a seat for me and I was able to save a seat for Sara. The Awards were shiny and we cheered for sundry people and organizations. Overall, I thought the presentations went well and other than the discomfort occasioned by being wedged in with other people (made my back twingy), I had a fine time. I gave up on the notion of the parties and called it a night. Morning brought another fine breakfast at Wildberry with Mark, Laurence and George Martindale. This was followed by packing, then a mad dash to the Dealer's Room where I intended to pick the last copy of "Silver Moon" from the Broad Universe table. I got there moments before someone who'd been at one of my panels came up and announced that she needed THAT book. Bliss! :-D Got that signed for her and thanked Roberta Rogow for doing a fine job of organizing things for BU. Then swung by the Sofawolf table to congratulate them on Ursula Vernon's win for "Digger." Chatted with Tim for a few minutes, and was given a gateway drug copy of "Digger" (I'm told I'll be reading all of them once I start :-). Said goodbye to a few more folks and went off to hear Julia Rios read. This was some seriously good fun (the stories she wrote when she was 9 were hilarious). And from thence onto the train. Overall Worldcon experience - very, very good. Didn't make it to a lot of programming items, other than my own, which I was somewhat sad about. On the other hand, I saw and/or met so many old and new friends that it was a really terrific con. I sold most of the copies of "Silver Moon" that I brought with me and distributed a ton of promo postcards. I must admit the really flattering thing for me about the con was hearing from so many people that they had read or had heard of "Silver Moon" or had it on their TBR list (and hey, it's Campbell Award-eligible for next year, just saying :-). Makes me feel like all the work I've been trying to do to promote the book is starting to pay off. Yesterday's BU tabling went well. I sold some books, both mine and other people's and chatted with various folks. I also got to briefly meet Rose Fox and John Jasper of PW, which was quite cool (they compounded that impression by saying nice things about "Silver Moon." :-). I chatted with Trevor Quechni, the new editor of Analog for a bit about Broad Universe. Then I sold a few books and CDs, including a couple of copies of "Silver Moon." I then went on to buy some jewelry from Kathyrn Arnold-Levanthal and from Laurie Edison and Jennifer Pelland's latest book from Apex Book Company. From there, it was off with friends to a nice Armenian restaurant for a jolly meal. Then back to the hotel, where i ran into Sigrid Ellis and we went to 2.5 parties, landing at the MN fandom gathering. Much hanging out and chatting with Jody Wurl, Magenta Griffith, Sara Olson and other fun folks. I pumpkined at 10:30PM. And to be continued, post dinner and possibly post-Hugos. Meant to post yesterday but it just wasn't happening. I do have resource/reading lists I need to type and add to the blog but I may not get to it until I get home. In the meantime, the "Writing Gender Roles in Science Fiction" panel yesterday morning went surprisingly well, considering we were down a moderator (also the only actual science fiction author). Julia Rios leaped valiantly forwarded and moderated and we managed to be entertaining enough that the audience a. stayed in the room and b. stayed awake and asking questions. We covered a whole range of feminist and flavors of queer stuff in histocial fantasy, other kinds of fantasy and works that other people had written which actually were science fiction. I also ran into one of my oldest friends, who had utterly failed to tell me that he was at the con. I did some wandering after that and caught 20 minutes of a panel on starting your own press, then wandered over to the short fiction panel that Julia was on to pick her up for lunch. Ran into Brit Mandelo en route and we go there just in time to hear an author hold forth for several minutes about why he didn't submit to Strange Horizons (this was not the question that had been posed, incidentally). What better time to be hanging out with the new fiction editors of same magazine? Sigh. Welcome to Worldcon. They held up well though and we had a nice lunch afterwards. From there, we went off to the Dealer's Room, where I ran into Eleanor Arnason and helped her find Laurie Edison's table, then ran into Brit again and helped her find the DreamHaven table to track down a book she was looking for, then ran into several other people, of whom I only remember Naomi Kritzer. I went on to the Broad Universe reading, which was pretty well attended, both by authors (some 15 or so) and audience (30 or so). Roberta Rogow ran a tight moderating ship and everyone managed to get in a few minutes of sundry works. A good time was had by all, as far as I know. I went off to go track down my dining companions and ran into deakat and Abra and several more folks. Mark and Laurence and Jana turned up and we went off to a nice dinner at the Tavern on the Park. I've decided that a life that includes nonalcoholic cucumber margaritas is a pretty decent one. After dinner, it was back to the con for me to do the LGBTQ in SF/F panel. This one was something of a mixed bag for me - I had a couple of WTF moments but nothing worth going into detail about without further reflection. We did manage to get it together to provide some book and other recommendations which I'll put out here as soon as I get to it. I stayed late talking to folks in the audience and signing a copy of Ladies of Trade Town before recognizing that I wasn't going make it to the parties. So back to the room with me for sleep time. And thus on to today. Had a lovely quiet breakfast at Wildberries, then went back for the SFWA meeting. I chatted with Sigurd Ellis for a bit, then talked to Lee Martindale and other folks post meeting. The last SFWA biz meeting I went to was the 2000 Worldcon, which was an utter and complete disaster so I want to note that this was well-run and efficient and did not make me want to flee the room shrieking. Good job, folks! Now I am sitting in a lobby chair on rather shaky wifi, hoping to get some work done before I go grab lunch before working a couple of hours at the Broad Universe table (1-3PM - stop by if you're here. There'll be copies of SIlver Moon as well as fine and amazing work by other Broads). I suspect I'll wind up at the Strange Horizons Tea Party, and thence to dinner with a college friend I haven't seen in 25 + years. Having a fine time overall and glad I came. Woke up to an eyeball melter migraine which necessitated ordering breakfast via room service - not an auspicious beginning to the day. But things improved from there. Once I was ambulatory, I staggered downstairs to find the various rooms I had programming items in (the hotel is split up in exciting ways). After I got my bearings, I ran into Elise and we went to go have elevensies in the hotel restaurant before my noon panel. From there, it was on to "We're Here, We're Queer...Are We Used to It?" with Cecilia Tan and Kevin Roche. We got a standing room only crowd and had a lively and free-ranging discussion more or less about LGBTQ fandom. I'll type up the recommendations later - I know Cecilia was doing it as well. As an aside, Kevin's one of the folks running Westercon this year and it sounds like fun. And Cecilia does fine, fine work on her own, as well as editing and publishing at Circlet Press. I did plug Lethe Press too, of course. Post-panel, I got to chat briefly with deakat, meet author Kyell Gold and his husband, reconnect with my friend Zeke who I haven't seen since shortly after college graduation and run into my friend George Martindale. George and Zeke and I headed down to the Dealer's Room, which was pretty challenging to get to, unfortunately. I checked in at the Broad Universe table and dropped off copies of "Silver Moon" and BU brochures. Then went across the aisle and met Zeke's wife, Kathryn and made dinner plans. George and I ran into Brit Mandelo and chatted for a bit, and from there it was on to the SFWA table for more checking in. We headed for the Art Show, then collapsed in the Con Suite space where we ran into Abra, Mike, Jody and friends. George and I met Jana for dinner and hung out until Lee Martindale got out of the daylong SFWA meeting, at which point we went aroving to find dinner for Lee and more chatting. Tomorrow, it's a 2 panels and the Broad Universe Reading day so hence to bed. (it does occasionally happen the other way around). Looking forward to a fun time! Just so I have some idea of what's going on and seeing as there's more of it than I was expecting. We`re Here, We`re Queer... Are we used to it? There have always been lesbian, gay, bi, and trans fans, and the appearance of queer characters in sf goes all the way back to the first story of Robert Heinlein\'s featuring Lazarus Long, published in 1949. But for decades GLBT characters were relegated to the background in \"mainstream\" sf. Recently, though, as queer characters have started to become commonplace in mundane tv, movies, and books, so have they moved into the fore in sf genre media, even video games. Lost Girl (Syfy) features a bisexual main heroine, Marvel comics just had their first gay wedding, Dragon Age has a gay romance plotline... Does this mean we\'ve won? Does this mean we\'re not special anymore? How does inclusion and visibility of GLBT characters in science fiction affect GLBT fandom, and fandom at large? How do you define and write great gender roles in science fiction and fantasy? Grand Suite 3 Members of the Broad Universe organization read short excepts from current works. Columbus IJ Discussion of non-straight characters and relationships in genre fiction. Saturday Sept. 1 - Dealer's Room. Broad Universe table - working a shift or two. Not sure when yet. There will be copies of Silver Moon for sale all weekend and I'm happy to autograph books. Sunday, Sept. 2 - 10-12PM Dealer's room. SFWA table. Autographing Silver Moon and volunteering selling books by SFWA members.